What monitor can I use with the Inspex HD 1080p? Ash recommends using a monitor with a resolution of 1920 x 1080 pixels to achieve optimal viewing. All of our measurements are calculated using a 24" monitor. Monitors can be purchased as an accessory with the Omni. Please note: during initial setup of your Omni, the user must select the lens and monitor size that they will be using. Do I need a PC with software to capture images? No. Inspex HD 1080p Vesa & Table both capture images directly to a USB memory stick, removing the need for a PC with software. Users have the option to purchase additional accessories such as Ash PC Capture (AI 100-052) to stream and save videos at full HD 60fps. What format is the image captured in? Images are cpatured to a USB 2.0 highspeed in 24 bitBMP file, 1920 x 1080 pixels. Is the Inspex USB port for connecting to a PC? No. The USB port allows images to be captured directly to a USB memory stick, without the need for a PC. Magnification is a combination of both the objective lens used and also the monitor size. 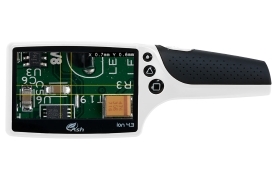 Inspex HD 1080p displays the current magnification on-screen, which can be configured for different objective lenses and monitor screen sizes. Our quoted magnifications are based on a 24″ monitor. 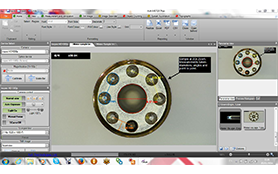 Please note: during initial setup of your Inspex, the user must select the lens and monitor size that they will be using. Technical specifications for all lenses can be found here. Inspex HD 1080p can be setup in minutes. An easy to follow User Guide Manual is provided with each order. What is the difference between each mounting arm? The Vesa Mounting Arm (AI 350-322) provides up to 470 mm reach and allows for variable height adjustment. With the Vesa Mounting Arm you can mount your Inspex Vesa and monitor simultaneously leaving your work desk completely free. The Dual Arm Boom Stand (AI 100-038) is a horizontal arm which provides an extended reach over large inspection areas. There is a weighted base for added stability. 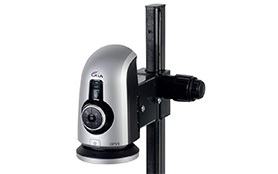 The Articulated Arm Stand (AI 100-039) is a multi-point adjustable arm for inspecting over a large area. The user has the choice of a desk clamp or weighted base. Yes. The objective lenses each have a standard 52mm thread to accept a range of filters. We provide a UV Polarizing Filter. What stands can I use with Inspex? The Inspex HD 1080p Table is a portable unit which does not require an additional stand. The Inspex Track Stand (AI 100-023) features a focus block that can travel the full length of the 500mm track for focus and camera height. Inspex Illuminated Track Stand (AI 100-023). This stand features a focus block that can travel the full length of the 500mm track for focus and camera height adjustment with integrated LED base illumination with light intensity control. What illuminated options are available? 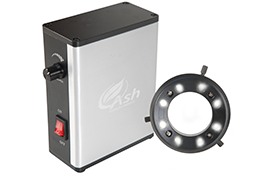 Controllable 8-point LED ring light (AI 100-012), providing optimum shadow-free illumination for a wide range of applications. Diffused LED Dome Light (AI 100-001) provides light intensity control and reduces glare. Inspex Illuminated Track Stand (AI 100-023) contains an integrated LED base illumination with light intensity control.